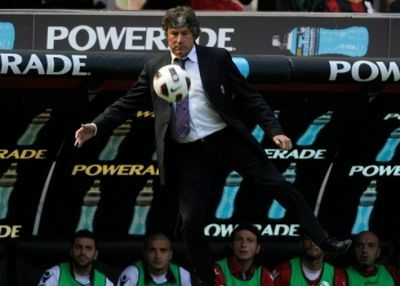 The 56 years old trainer of Bologna Alberto Malesani is the new trainer of Genoa. In the past he did win the Uefa-cup and the Coppa Italia with Parma and he can make us happy by repeating this with Genoa. Today Genoa bought the 26 year old and 1.92 tall defender Andreas Granqvist of FC Groningen. The Swedish defender signed a 4 years contract and was also wanted by Glasgow Rangers and Galatasaray. The 4th edition of United in the name of Genoa took place in Naarden, Holland. The team of the Flying Dutch Doctors who celebrate their 30th anniversary this year organized the tournament perfectly with all drinks and food for free! 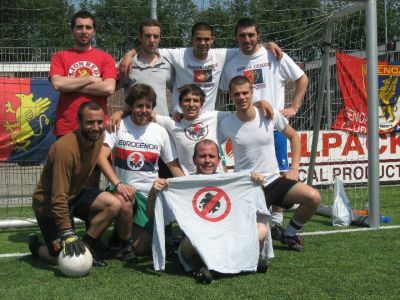 The two strongest of the 7 teams played the final: the Grifoni of Piazza Manin and the team of BFC, Naarden. The match ended in a 2-2 draw, so the penalties had to bring the winner. 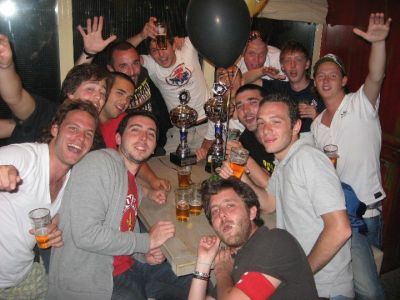 The Italians kept their minds cool and went home with the big trophy. Auguri, Forza Vecchio Cuore Rossoblu ! 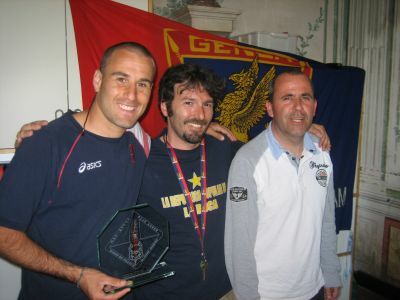 The day before the derby member of honour Luca Carini and Hans Otten went to the Pegli-trainingfield to present the trophy of Genoa Club Amsterdam Genoano of the year 2009-2010 to Rodrigo Palacio. In his first year Rodrigo immediately became our topscorer and showed everybody that he did not had any problems with the Italian footballstyle. Also this season Rodrigo scored 9 goals and gave many assists that were scored by his teammates. Just after we honoured very friendly Rodrigo big teams like Roma and Inter are at once interested to buy our favorite player. Maybe next year we have to give the trophy in silence to our best player …. Forza Rodrigo, resta con noi ! !